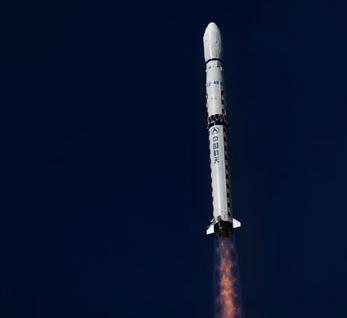 China’s return to launch action continued with the Tuesday launch of a new high-resolution observation satellite. 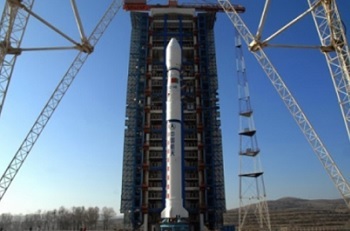 The Gaofen-2 (GF-2) was launched at 03:15 UTC by a Long March-4B (Chang Zheng-4B) rocket from the LC9 launch complex of the Taiyuan Satellite Launch Center. Also on board was the Polish satellite BRITE-PL-2, also known as “Heweliusz”. The Gaofen satellites are a series of high-resolution optical Earth observation satellites of China National Space Administration. In English ‘gao fen’ means ‘high resolution’. The civilian High-Definition Earth Observation Satellite program was proposed in 2006, receiving government approval on the next years and initiated in 2010. The plan was to launch six Gaofen satellites between 2013 and 2016. The first satellite, Gaofen-1, was launched on April 26, 2013, by the Long March-2D (Y18) from the Jiuquan Satellite Launch Center. The main goal of the Gaofen series is to provide near real-time observations for disaster prevention and relief, climate change monitoring, geographical mapping, environment and resource surveying, as well as for precision agriculture support. The major users of the observation data will be the Ministry of Land and Resources, Ministry of Environmental Protection, and the Ministry of Agriculture. In 2010, the Chinese government approved to implement the China High-resolution Earth Observation System (CHEOS), which is an extension of the High-Definition Earth Observation Satellite program. The CHEOS series will consist of seven optical/microwave satellites. The Earth Observation System and Data Center of the China National Space Administration is responsible for organizing the construction of the CHEOS program. The CHEOS program comprises the elements of the spaceborne system, the near-space system, aerial system, the ground system and application system as a whole to realize Earth observation at high temporal, spatial and spectral resolution. The implementation plan of CHEOS satellite series has a development period between 2010 and 2020. With the launch of GF-2 in 2014, by 2016 the next three satellites will be launched. The entire CHEOS series of satellites will be in orbit by 2020. GF-2 employs the CS-L3000A bus and is capable of producing images with a ground sampling distance of 80 centimeters in black and white, and 3.2 meters in color. Its images have a swath width of 48 kilometers, and the satellite is capable of swiveling on its axis 35 degrees to either side, according to Zhou Zi Kuan, director of international business development at CRESDA, a unit of the China Aerospace Science and Technology Corp.. The satellite will operate between 4 and 8 years. 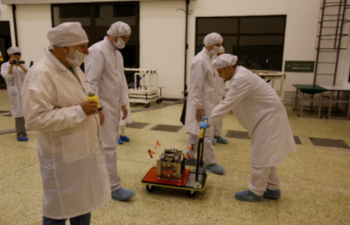 The satellite was originally schedule to launch in December 2013, but the launch was delayed because of the launch failure of the Long March-4B that was supposed to orbit the Brazilian CBERS-3 on December 9, 2013. The first scientific satellites to explore the stars that are brighter and hotter than the Sun were developed in Poland during between 2010 and 2012. The project will will be helpful in understanding the internal structure of the biggest stars in our galaxy. Star oscillation will be investigated with the help of BRITE satellite constellations, designed within the Bright Target Explorer (BRITE) project and developed as the Canadian-Austrian-Polish cooperation. The satellites will be taking images of the sky with a wide-field camera in order to precisely measure the brightness of the brightest stars. Measuring these stars precisely from the Earth’s surface proves to be a difficult task, even though they are easily detectable during a cloudless night. A few hundred (500-800) stars of the Milky Way will be observed during the experiment. Polish scientists intend to investigate the mechanism of convection, which is the transportation of energy that takes place in the hottest stars. This is an important occurrence in nature that physicists have known for over 100 years, however it does not yet have a mathematical description. The BRITE project will help explain the phenomenon. Disturbances in the Earth’s atmospheric transparency severely limits the accuracy of the brightness’s measurement. A small wide-angle camera sent into space will see a large amount of bright stars, without the distortion and unpredictable impact of the atmosphere. On December 16, 2009 The Minister of Science and Higher Education signed a decision to grant funding (from the Fund for Polish Science and Technology) for the project. The satellite, which is designed to observe the brightest stars in our Galaxy, is the Polish contribution to the BRITE mission, developed by a consortium of Canadian, Austrian and Polish institutes. According to the agreement with the Minister two Polish satellites were been built: Lem and Heweliusz. Lem was launched on 21 November 2013. BRITE’s design originates from a Canadian idea developed by Emeritus Professor Slavek Rucinski of the University of Toronto, inspired by technology developed for MOST. All six nanosatellites in the BRITE constellation are built according to that concept. 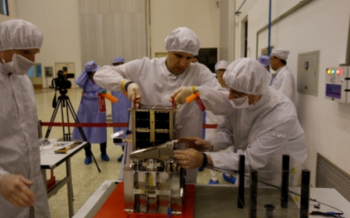 BRITE satellites are so-called nanosatellites weighing less than 10 kg. Poland runs the research program with the Space Flight Laboratory (SFL) of the University of Toronto which specializes in developing and manufacturing such small satellites. According to the agreement with SFL, the Canadian side provided most of the components and subsystems necessary for the integration of the first satellite, the complete documentation, and trained a team of Polish engineers to properly carry out the integration and testing of the satellite before it was launched. In the case of the second satellite the number of components supplied from Canada were limited. What’s more, a large part of the subsystems have been developed in SRC PAS and manufactured in Poland. BRITE program is an unprecedented opportunity not only for Polish science, but also for the Polish industry to obtain new technologies and at the same time to create a prestigious international forum for the exploration of space. In this context, the possibility of the implementing a complete integration of both satellites in Poland was very important to Polish authorities, especially regarding completing the tests before launching the satellites into the orbit. Launching a Polish-owned satellite also required taking large formal, administrative and logistical action on a scale not yet implemented in Poland. All spacecraft in the constellation use the GNB (Generic Nanosatellite Bus) platform, referred to as CanX-3, developed at UTIAS/SFL (of CanX-2 heritage). The GNB was originally developed in SFL for BRITE and Can-X-4/5 missions. The satellite measures 200 mm x 200 mm x 200 mm in size, has the mass of about 7 kg and includes a full suite of advanced capabilities. This includes a dual battery, gallium arsenide triple-junction solar cell based power system that includes peak power tracking capabilities; a full 3-axis attitude determination and control system that allows arbitrary inertial or orbit-frame alignment (including nadir, along-track and cross-track). Also, a powerful complement of on-board computer processing systems, include a computer dedicated to payload activities; a flexible TT&C and payload data RF communication system, allowing for variable and high speed data downlinks to the ground. Included is a large accommodation for payloads, including volume, mass, power, and spacecraft surface area; capable of attitude determination of 10 arcseconds and a attitude control accuracy of better than 1.0º; and an attitude control stability of 1 arcmin rms (root mean square). The satellite has a power of 5.4 W to 10 W, a battery capacity of 5.3 Ah, a data downlink capability up to 256 kbit/s and a payload data storage capacity of up to 256 MB. BRITE-PL-2 “Heweliusz” (also designated CanX-3D) is a 20 x 20 x 20 cm satellite with a launch mass of 6 kg. The small satellite will make photometric observations of some of the brightest stars in the sky in order to examine these stars for variability. The observations will have a precision at least 10 times better than achievable using ground-based observations. 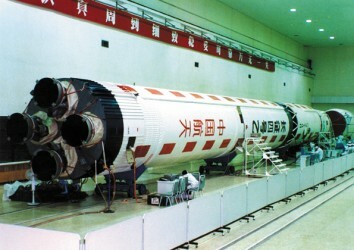 The feasibility study of the CZ-4 Chang Zheng-4 (Long March-4) began in 1982 based on the FB-1 Feng Bao-1 launch vehicle. Engineering development was initiated in the following year. Initially, the Long March-4 served as a back-up launch vehicle for Long March-3 to launch China’s communications satellites. After the successful launch of China’s first DFH-2 communications satellites by Long March-3, the main mission of the Long March-4 was shifted to launch sun-synchronous orbit meteorological satellites. On other hand, the Long March-4B launch vehicle was first introduced in May 1999 and also developed by the Shanghai Academy of Space Flight Technology (SAST), based on the Long March-4. The rocket is capable of launching a 2,800 kg satellite into low Earth orbit, developing 2,971 kN at launch. With a mass of 248,470 kg, the CZ-4B is 45.58 meters long and has a diameter of 3.35 meters. SAST began to develop the Long March-4B in February 1989. Originally, it was scheduled to be commissioned in 1997, but the first launch didn’t take place until late 1999. The modifications introduced on the Long March-4B included a larger satellite fairing and the replacement of the original mechanical-electrical control on the Long March-4 with an electronic control. Other modifications were an improved telemetry, tracking, control, and self-destruction systems with smaller size and lighter weight; a revised nuzzle design in the second stage for better high-altitude performance; a propellant management system for the second stage to reduce the spare propellant amount, thus increasing the vehicle’s payload capability and a propellant jettison system on the third-stage. The first stage has a 24.65 meter length with a 3.35 meter diameter, consuming 183,340 kg of N2O4/UDMH (gross mass of first stage is 193,330 kg). The vehicle is equipped with a YF-21B engine capable of a ground thrust of 2,971 kN and a ground specific impulse of 2,550 Ns/kg. The second stage has a 10.40 meter length with a 3.35 meter diameter and 38,326 kg, consuming 35,374 kg of N2O4/UDMH. The vehicle is equipped with a YF-22B main engine capable of a vacuum thrust of 742 kN and four YF-23B vernier engines with a vacuum thrust of 47.1 kN (specific impulses of 2,922 Ns/kg and 2,834 Ns/kg, respectively).